London-based filmmaker Ben Rivers has two films at the Toronto International Film Festival this year. TIFF's excellent Wavelengths programmer Andréa Picard curated the two experimental films. In Slow Action, Rivers visits four locations around the world: Lanzarote, Gunkanjima, Tuvalu and Somerset. Shooting on 16 mm film using an anamorphic lens, he transforms real places into imagined communities imbued with mystery. An accompanying soundtrack pipes through headphones, telling the evolution story of each community. While the locations are different, they share a strange, somewhat otherworldly feel. Slow Action is on view at Gallery TPW from September 8 - October 1, 2011. The gallery setting -- with its beanbag chairs, headphones and 16 mm projector -- is an immersive, meditative space. The short video embedded above has some edited footage from the Tuvalu part of the film. The sound is from the 16 mm film projector and not the audio from the headphones. Sack Barrow (2011) is a selection in Wavelengths, TIFF's avant-garde programme,which screened at the Art Gallery of Ontario's Jackman Hall cinema. 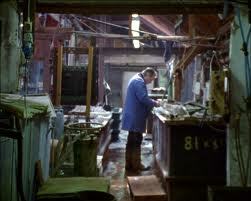 The film is a portrait of a London-suburb plating factory. Rivers captures the factory's gritty surfaces blending nostalgia and unflinching reality. With footage of pin-up girls, the film is playful with moments of humour. Rivers' two films at TIFF are immersive experiences challenging constructs of story, time and place. The films are engrossing, playful portraits that resonate with mystery and strangeness. The places are real yet unfamiliar and, ultimately, transformed in the films.